rWhen a small, $400 remote-controlled quadcopter drone landed on the grounds of the White House in February 2015, Obama administration officials were in full freak-out mode. Just 10 days before that incident, officials from the Department of Homeland Security, the U.S. military, and the FAA huddled for a “summit” regarding a danger that they had been contemplating for years: Terrorists’ use of weaponized drones for attacks or assassination. The officials played videos of low-cost drones firing semi-automatic weapons, revealed that Syrian rebels are importing consumer-grade drones to launch attacks, and flashed photos from an exercise that pitted $5,000 worth of drones against a convoy of armored vehicles. (The drones won). As it turns out, the quadcopter that landed on White House grounds simply got away from its owner, who was goofing around with it in the wee hours of the morning. But the fact that it landed there at all, coupled with mounting evidence that groups around the world are increasingly weaponizing drones of all shapes and sizes, is alarming. Over the last six months, ISIS has increased its use of weaponized and surveillance drones against Iraqi and U.S. forces. U.S. Central Command told Fox News coalition troops have as many as 30 encounters a week with unmanned aerial vehicles. These drones are inexpensive ones modified to drop grenades or to surveil troop movements. In those preceding months, the U.S. military reported destroying at least five ISIS drone facilities — one factory and four storage areas. This new emerging threat has led some experts to question aloud whether the U.S. is prepared to adequately defend against weaponized drones. As drone technology improves and people begin to figure out new ways to make them deadly, Waltz says the U.S. government will need to figure out how to secure its critical infrastructure — military bases, nuclear plants, standard power plants, dams, air traffic control, water treatment facilities, and the financial sector. “A nightmare scenario could be 20 to 25 of these drones that you could buy over the counter that have been weaponized with explosives that you can put on a timer with GPS coordinates to a military base or a nuclear facility or Capitol building that could attack in a swarm-like fashion,” Waltz told Fox News. Drone makers like Phantom are taking voluntary steps to prevent their products from becoming weaponized. 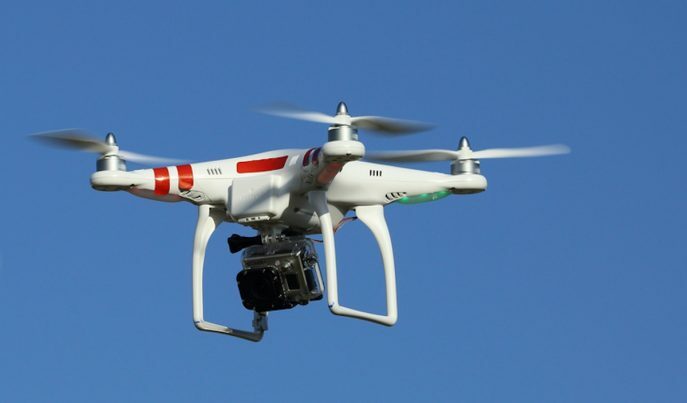 For instance, Wired noted, the China-based company began adding a “mandatory firmware update” for its Phantom 2 that prevents the drone from flying within a 15.5-mile radius of the White House. But clearly, U.S. officials are concerned that terrorist use of weaponized drones is not just a concept but a practice being used more and more — in and out of conflict zones. It’s just a matter of time before they come to our cities and towns.